Recently, I have been contemplating all the various theological differences among us Christians. And it saddens me that we can become so separated by our misunderstandings of Scripture. I will admit that I have had to stop and ask myself, "Do I believe ____ because the Bible says so, or because I have heard it preached from the pulpit, or taught by a Sunday School teacher, or because a well-known theologian or scholar has proposed it"? It's amazing how the different translations can influence our understanding of God's Word, too. But perhaps more than anything else, I am amazed at the number of Christians who don't really read the Word. And I'm not talking about just following along with the two or three verses your Pastor bases his Sunday morning sermon on. I'm talking about spending hours each day immersing yourself in God's inspired revelation to us; going back and forth between the Old and New Testament, verifying God's continual theme of relationship with His creation; studying historical documents to understand the cultural context of what a Biblical writer was referencing. I find it quite arrogant for us to think that we, as 21st Century Christians, are the ultimate authorities on what God meant to be revealed through the Biblical writers! How many Westernized Christians give credence to the fact that the Bible's roots are Hebraic? That Jesus was a Jew, and so were all the Apostles? How is that we try to mold what the Bible clearly says into something that makes sense to our modern minds? Today, I want to examine two very common doctrines that seem to increasingly divide the Body of Christ. They will not be new to those of you who read my blog. You will recognize them as a common theme of my writing, but I want to show you just how important it is that we read and examine our Bibles for God's Truth. When the Word is not our primary Source for Truth, then we prohibit the Holy Spirit from helping us to grow into the image of Christ as exemplified in the Divine revelation. What a clever way for the Enemy to keep us from walking in our true identities! Take for example, the modern doctrine of Replacement Theology. If you're not familiar with this term, it is essentially a Christian doctrine that teaches that "the Church" has replaced Israel in God's plan of redemption. In other words, this doctrine purports that with the rejection of Christ as the Jewish Messiah, the Biblical people of Israel are no longer God's chosen people, and the modern Church now holds that coveted title. Furthermore, adherents believe that not only has the Church replaced Israel in God's plan [and heart], but all the promises made to Israel are now fulfilled in the Christian Church. But this doctrine cannot be substantiated by Scripture! And in order to "prove" the doctrine to be true, the concept of "replacement" has to be interpreted or represented symbolically, or allegorically. Why don't we just read what the Bible says? I challenge anyone who upholds the doctrine of Replacement Theology to read Romans, Chapter 11. And if they only consent to read one or two verses, then let it be verses 11 and 12. It's as though God inspired the Apostle Paul to be as clear as possible, speaking down through the centuries, as he declares: So, am I saying that Israel stumbled so badly that they will never get back up? Certainly not! Rather, it was because of their stumble that salvation now extends to all the non-Jewish people, in order to make Israel jealous and desire the very things that God has freely given them. So if all the world is being greatly enriched through their failure, and through their fall great spiritual wealth is given to the non-Jewish people, imagine how much more will Israel’s awakening [full restoration] bring to us all? Then, if there is any doubt left at all in the mind of the modern Christian, I would point them to Romans 11:15, For if their temporary rejection released the reconciling power of grace into the world, what will happen when Israel is reinstated and reconciled to God? It will unleash resurrection power throughout the whole earth! After reading this passage, how can anyone assert that God is through with Israel, or that we have replaced them? Where do they get the idea that "Israel" can now be understood to be "the Church"? It simply doesn't exist in Scripture! We should be thankful for God's mercy towards us, allowing Salvation to become our inheritance; while praying for the restoration of Israel so that Jesus might return and the fullness of the Faithful be resurrected to eternal life! This is just one example of the modern Church getting it wrong! It is so important that we know what the Bible says, rather than relying on our denominational interpretation, or even the scholarly opinions of our favorite evangelists or teachers. Everything should be verified by Scripture. And we must be careful not to define our theology based on one verse or passage, but seek to discover God's whole counsel on the matter. Again, Paul warned that Even some from among our very own ranks will rise up, twisting the truth to seduce people into following them instead of Jesus. I have found this to be true when attempting to discuss the concept of our Power and Authority as disciples of Jesus. Rather than reading what the Word (Jesus) says about it, I have encountered many faithful Christians who refuse to consider this truth because it is unfamiliar to them. But instead of seeking the revealed counsel of God through Scripture, they cling to their lack of knowledge [or the teachings of their particular church] as their basis for denial. Even a cursory examination of the Bible should reveal enough affirming Scripture to cause one to seek the full counsel of God on the matter. Matthew 10:1 says, Jesus gathered his twelve disciples and imparted to them authority to cast out demons and to heal every sickness and every disease. To "impart" means to "give, confer [on], bestow". Later, in verse 8, Jesus tells those same disciples, Freely, you have received the power of the kingdom, so freely release it to others". There is so much here to glean, that it should illuminate our spirits! Scripture tells us that Jesus passed on (imparted) the authority He was given by the Father to the twelve disciples so they could join in doing the work the Father told Him to do. Then He makes it clear that with that authority, they have been given the power to do the work, and that power came directly from the Kingdom of God in Heaven! Furthermore, the power was the same power that worked through Jesus (the man) -- the power of the Holy Spirit! But remember, this is the first time He is loaning His authority and the power of the Holy Spirit to them. He only has three years to train them up and prepare them to carry on His work and establish the Kingdom power and authority of the Believer [until the time He returns]. They are only apprentices at this point, and they are not ready to receive their full commission. They weren't ready to walk in their full power yet, so in essence, Jesus lent them His, while He oversaw their education, so to speak. Three years later, they would be instructed to go to Jerusalem and wait for their own mighty power of Heaven to fall upon them. A careful study of Scripture will confirm this revelation: Jesus came not only as the Son of God to redeem us from God's righteous wrath. But He came as our role model to show us how to live as Sons and Daughters of God on this earth. The following Scriptures verify this truth: Matthew 10:1, Luke 9:1, Luke 10:19, Matthew 16:19, Luke 4:36, Ephesians 1:19-20, and Colossians 2:9-10. 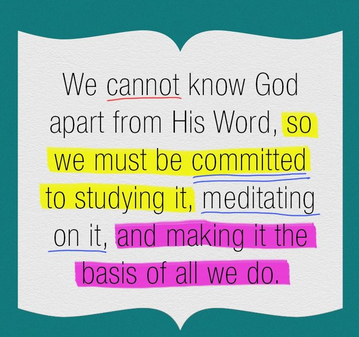 Can you see how important it is to know and study the Word -- every page, and verse, and word of it! We cannot rely on someone else to teach us. Yes, we have pastors and teachers and prophets and evangelists to enlighten us, but they are to equip and train us to become MATURE Believers --- so that we may no longer be children, tossed to and fro by the waves [novel teachings] and carried about by every wind of doctrine, by human cunning, by craftiness in deceitful schemes (Ephesians 4:14). We are to experience the fullness of what it means to know the Son of God and the Father. And that is only revealed when we spend time with Them. I know it sounds trite to implore that you "spend time in the Word". But it is the one place you will encounter the fullness of God -- where you can receive the undefiled and pure revelation of the One who loves us perfectly. Know Him from His Word first, and then let all other authorities measure up to His absolute Truth. Psalm 119:130 Break open Your word within me until revelation-light shines out! Those with open hearts are given insight into Your plans. Belle, I whole heartedly agree with your perspective and support your efforts. However I wonder how long we blow the horn to a body of believers who refuse to move of of tenuous theology and doctrine? I for one am tired of trying to articulate such an obvious concept to "thick" believers. Can we call them believers if they dont really believe what Jesus told them to do? He even says "why do you call me master and dont do what I say?" Im kind of tired of pushing this point and feel as though Ive been totally ineffective. I am taking my message to the non churched where I have a much better and more engaged crowd. Keep up the good work and fight the good fight! Interesting - the commenter says, " I am taking my message to the nonchurched .... " , I find that refreshing ! I think of who called for the persecution and crucifixion of Christ, was it not the " religious " ? We are told to get off the bottle of milk and develop an appetite for " solid foods ". To me, the " milk " is like a grade school student who understands the stories told in Genesis - you know, Abraham, Moses, Red Sea etc., the so-called " milk " of our understanding , but then there comes a time that we are to understand the more challenging aspects of our faith as presented in Romans, and Hebrews - the " solid food " if you will. For me and my house ( my wife and I ) we are embarking on a serious study of New Testament and Old alike. And, I suppose - like the comment above - we are doing so to be a more powerful and authoritative source to present the entirety of the Bible as a VALID and divinely inspired book to those who may have " missed it "
I can't tell you how encouraged I am by these two comments! I, myself, feel as if I am awakening to a new reality of who I was designed to be, and I have a hunger to escape the bonds of this world and engage with the Kingdom realm. I know that's why the Holy Spirit was sent to me! So I hope you will read the latest post and upcoming ones, because I am going to be sharing where Jesus is taking me. And I bless the study that you are your wife are embarking upon, praising the Lord in advance for the insight and journey He is going to take you on. In your hunger for the Word, I know you are going to enjoy the solid food so much more than the milk!